What are the common challenges with traditional log aggregators? Traditional open-source logging tools require teams to set up their own log aggregation server. These tools also need several integrations and often have a lengthy configuration; managing this complex setup is a resource-intensive task. Modern enterprises have their data spread across a multi-cloud environment with numerous endpoints. Traditional tools are not designed to handle massive log volumes arising from such distributed setups and can get painfully slow when searching older logs. While managing logs in one place has its benefits, finding useful information in these text logs is not easy. Traditional log aggregators offer little help when it comes to searching and analyzing the logs for troubleshooting and reporting. Unlike traditional log file aggregation tools, setting up SolarWinds® Loggly® is extremely fast and simple. Its agentless architecture ensures that you don’t have to install and log an extra piece of software for pulling logs from any log source. You can send logs to Loggly over syslog or HTTP/S or from any other log source (e.g., Docker, Fluentd, rsyslog). While the centralized management of logs makes things simple, the cloud-based setup also offers easy scalability to handle unpredictable spikes in log volume. This ensures that none of the critical log data is ever lost. When logs get past the log retention period, Loggly can store them in AWS S3 buckets. Here, logs can be retained as long as you want them for compliance, or any other requirement. Loggly gives you the ability to unify all your logs in one place and search across the entire stack with near-instant results. An interactive interface and comprehensive search capabilities with a simple query language further reduce time in troubleshooting. Loggly parses your log data as soon as it receives it, not just when you conduct a search. This means that it can map the structure of your logs in near real time, enabling you to quickly and easily browse your logs. This visual view guides you to where to look for operational problems, and exposes issues from places that you might miss otherwise. 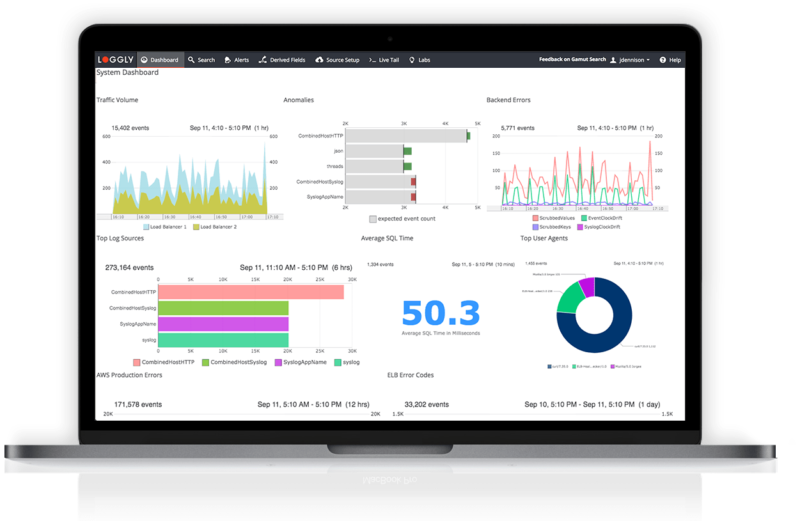 Loggly simplifies troubleshooting with many advanced charts and interactive dashboards. The charts help you visually monitor text logs, which makes it simple to spot trends and find patterns over a period. These charts can be displayed on shareable dashboards, unifying infrastructure and application data in one place for easy correlation. You can click a spike in the dashboard to find associated logs for deeper troubleshooting. The timeshift function helps you monitor key trends over a period and the anomaly chart helps in early detection and mitigation of issues. Loggly also offers easy integration with popular notification services (i.e., Slack, Hipchat, Pagerduty) for alerting. Furthermore, Loggly can help in reducing alert fatigue by offering a better approach over traditional, count-based threshold alerts.